That's a long name, isn't it? Dan W recently presented me with this tall, oddly shaped bottle claiming it to be good. Well let's find out. First off we've had a decent run with Italian soda, so that's a plus. Secondly it's not only pear, it's apple too. That has to be good. 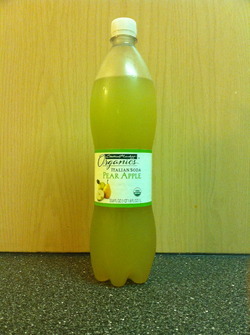 Finally, the ingredients: organic pear and apple juice from concentrate, organic sugar, natural apple flavors, natural pear flavor, etc. Nothing bad here. Even made it Italy, which works with the whole Italian soda thing. Sadly it's missing something. What that is, I'm not sure. Maybe it's too watery, with not enough fruit flavors? Maybe the sweetening needs to be kicked up a bit? Perhaps it needs more bite? I can't tell what's wrong, but something is. It's crisp, but at the same time too heavy. But how is it heavy when it's lacking flavor? This may sound ridiculous but I think part of it is the bottle. This is the first time I'm going to say the plastic bottle may be the culprit here, because there seems to be a kind of plastic-y thing going on with it. I could just be trying to find out what's wrong with it and grabbing at straws. Who knows? All I know is despite all it's positives, it's missing something, and that's a bummer.